Train travel is probably my favourite type of travel of all and for so many reasons. Usually the train station is located right in the middle of town, way cheaper and easier to get to than an airport. There’s usually no pesky security lines, you can just jump right on the train. You’re able to move around a lot more than when compared to a bus, traveling by car, or even by plane. You get one of the best views of a country, all while traveling fast and without any turbulence. Sounds pretty awesome to me! I love traveling by train, but usually just show up to the station on the day and book whatever tickets are available. But recently I found out there’s an incredibly simple hack that can reduce the cost of your train ticket by over 80% the only catch? Booking in advance. You can save serious money by booking in advance. About 2 or 3 months in advance is all it takes to ensure the best savings, but you’ll even save a considerable amount by booking 4 weeks in advance. Want to know more? 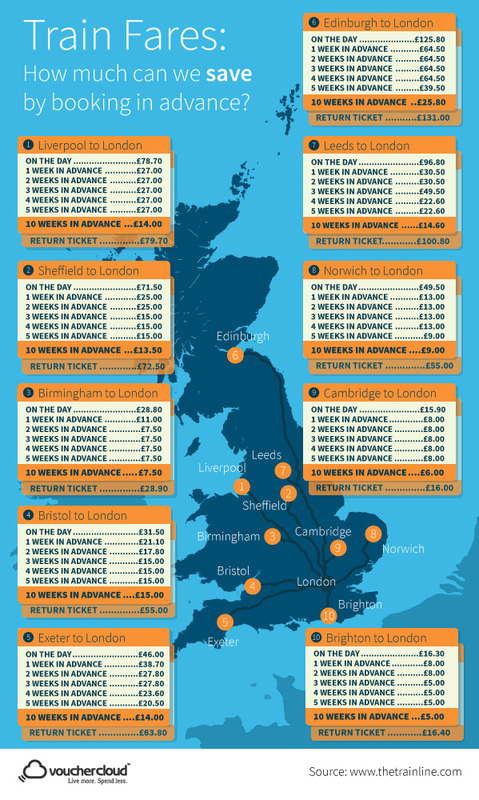 This amazing infographic from Voucher Cloud shows how much you can really save by booking your train ticket around 10 weeks earlier than your travel date. I had no idea the savings were so big!